Western Whiskey Gazette (WWG): Roth & Co.
Every now and then I get something interesting in my "mailbox". This morning I received an email from a non-collector who's wife had somehow fallen heir to a piece of history. 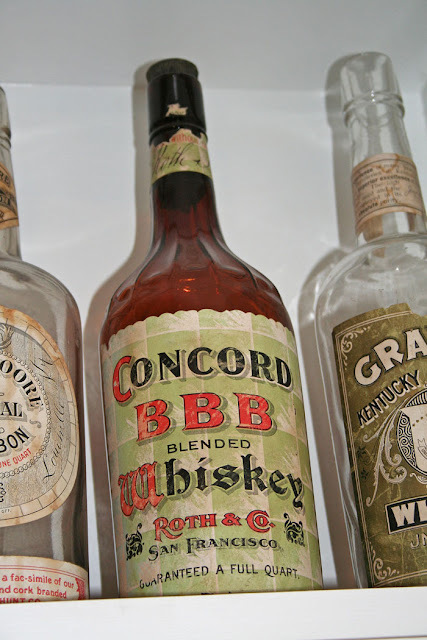 "I am not a collector or dealer, just a guy whose wife was recently given an amber-colored glass Roth & Co. (San Francisco) Bourbon Whisky bottle that is very obviously from right after the 1906 earthquake. She would like to dispose of it for what it is worth, and is of course nervous that since wee (sic) don’t know anything about bottle collecting, she might let get (sic) skunked by some very experienced (but unscrupulous) collector. Can you give us some idea what this might be worth and the best way for someone who has no interest in collecting, or indeed bottles at all, to expose it to the right potential collectors? Has an internal screw-top stopper, stippled on top, not marked with any company name. The remains of a purple lead seal still present. The labels have not been cleaned. the great San Francisco Fire, April 18th, 19th and 20th. ROTH & CO. 20 - __ NO BRYANT ST "
Ok, so the photos aren't much but what is fascinating is the address on the neck label. Most of us know that Roth and Co. was located at 316 Market St. at 5:12 AM on April 18, 1906. That location turned into a big wet black spot (WBS in firefighter lingo) by about noon that day; the firm loosing their entire inventory of liquor, bottles and everything else needed to conduct business. We also knew that by 1907, they were residing comfortably in their new digs located at 115 -117 Front St.; less than a block away. However, the location of Roth & Co. in the months immediately following the earthquake has remained a mystery; until now. Bryant St. (probably in the 200 block), which coincidentally or not, is just 4 short blocks from the old Market St. location was their (a) temporary location; or was it? 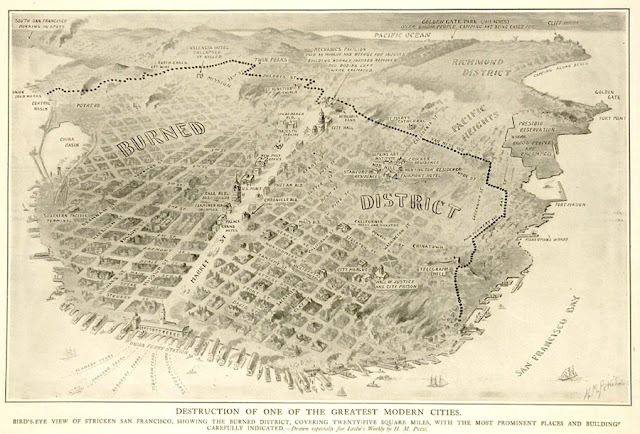 In an attempt to pinpoint the address, I located a book entitled; "Relief business directory, May, 1906; giving names, business and address of San Francisco firms and business men who were compelled to change their location by the disaster of April 18 : and who have since located in San Francisco". But rather than pinpoint the Bryant St. location, it gives yet another for Roth & Co.; 1935 Clay St. the month following the disaster. Actually, not surprising, since this area of the City was comparatively unaffected by the holocaust that incinerated the business district following the devastating tremor. Survival of the fittest, I'd say. And so, we can now add yet two more locations to the seemingly endless list of addresses occupied by Roth & Co. over their incredible sixty year tenure in the wholesale liquor industry of San Francisco. Oh, and if anyone is interested, the bottle is available and I can put you in touch with the owner. For just plain 1906 S.F. Earthquake history as it relates to the wholesale liquor trade, this example is tough to top.